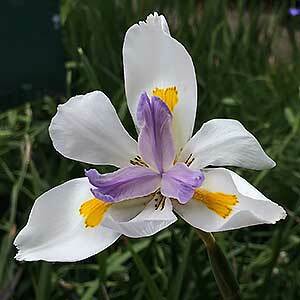 Widely used in landscaping, Dietes grandiflora or Wild Iris as it is commonly called is from southern Africa. Grown for the evergreen foliage as well as the colourful flowers it is easy care and makes a great plant for mass planting in full sun to a little shade. The flower stems will actually produce flowers over a few years, so although the spent flower heads themselves should be removed , the flower stems themselves should not be pruned away. Once established these are a very low care plant. They will need to be divided after 4 – 5 years to promote good flowering. Pruning is a little harsh, with the whole plant being pruned right back to ground level. After pruning its time to fertilise and water, within a month or so new growth will appear and the clump will be revitalised. When planting a spacing of around 40cm will be suitable as the plants will spread reasonably quickly to cover the area. Foliage – Strap like evergreen foliage, mid to deep green in cooler.